Surveillance video obtained exclusively by NBC 4 New York shows the moments before suspected New York and New Jersey bomber Ahmad Rahami dumped luggage containing a pressure-cooker bomb on a Manhattan street Saturday night, authorities say. Rahami is seen walking down West 27th Street in Chelsea at about 8:30 p.m. Saturday, around the time another device allegedly planted by Rahami exploded on West 23rd Street. Rahami appears calm as he wheels the piece of luggage behind him. He stops, appears to unzip and fidget with something inside the bag -- a pressure-cooker bomb, according to authorities. He gets back up and continues walking down the street. Moments later, two men who happened to be walking on the same side of the street behind Rahami find the suitcase. It's not seen in the video obtained by NBC 4, but police said they opened the suitcase, removed the pressure cooker and walked off. Those men are not considered suspects, only witnesses, and police want to speak to them and recover the bag. 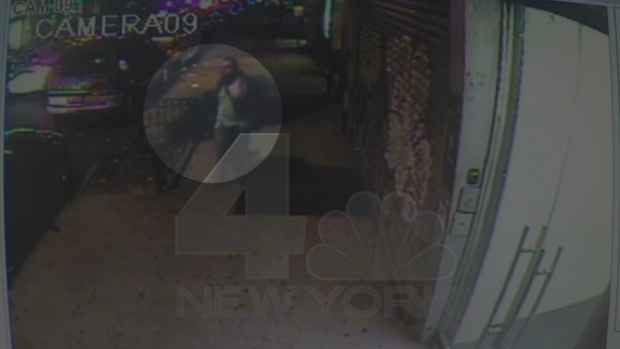 Surveillance video obtained exclusively by NBC 4 New York shows the moment that suspected New York and New Jersey bomber Ahmad Rahami moments before he dumped luggage containing a pressure-cooker bomb on a Manhattan street Saturday night, authorities say. The bomb that exploded on 23rd Street injured 31 people. Rahami has been charged in federal court with planting those devices and several more in two locations in New Jersey. He is still recovering from gunshot wounds he received in a Linden, New Jersey shootout when he was arrested Monday, and faces more charges for allegedly wounding two officers.